Albert Wallace Hull (☆ April 19. 1880	in Southington, Connecticut – † January 22. 1966 in Schenectady, New York) is an American physicist and electrical engineer. 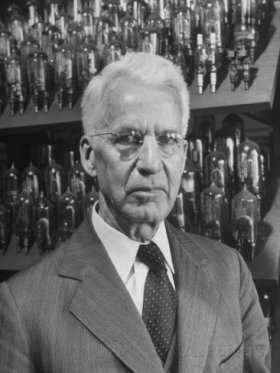 He received his Doctorate in physics from Yale in 1909 and taught at Worcester Polytechnic Institute before leaving in 1913 to join the General Electric Research Laboratory. He was made assistant director in 1928 and retired in 1950. He did pioneering work in industrial electronics with electron tubes, and is credited with inventing the magnetron and thyratron tubes. He is credited with a total of 94 patents.